While Fort Erie is home to a number of tourism attractors, including the 121 year old Fort Erie Race Track, Safari Niagara, Historic Fort Erie (or “the Olde Fort” as locals call it), Crystal/Bay beach, Downtown Ridgeway and numerous local festivals, it is the job of the Fort Erie Economic Development & Tourism Corporation (EDTC) to encourage the ongoing development of these existing attractors and spur on the development of new and exciting tourism generators in Fort Erie. 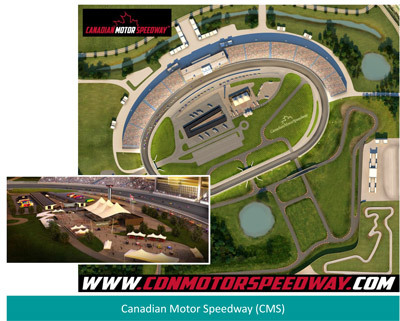 Canadian Motor Speedway (CMS) - is a $150 million racetrack development proposal of 820 acres of land in Fort Erie directly adjacent to the QEW within 5 miles of the Canadian/U.S. border and 11.2 miles from Niagara Falls. It will include ancillary construction for infrastructure, recreational, commercial, industrial and educational uses that will expand the build-out to $400 million. a logistical Centre of Excellence and Innovation integrating higher learning with research and development including prototype production and testing. The Centre of Excellence and Innovation comprises up to 8.5 ha for a mechanical engineering satellite campus connected with McMaster University and for prototype production and assembly area resulting from the satellite campus and the association with testing at the Speedway approximately 116.5 hectares (288 acres) to be maintained for the enhancement of natural features identified within the constraint areas. Safari Niagara - Fort Erie’s “wildest” attraction. The EDTC is assisting Safari Niagara, as they continue to plan for a major expansion at the Stevensville Road site. The expansion will include additional animal habitat, a camping facility and much, much more! Fort Erie Race Track – Potential home to a new $300 million dollar destination attraction at the site of the Fort Erie Race Track. Initial plans call for a convention facility, water-park, indoor carting facility, hotel, retail outlets, commercial space, restaurants, golf centre, Niagara wine pavilion, and new grandstand and backstretch facilities. Designed to act as Niagara’s southern tourism anchor, the destination attraction will provide visitors to Niagara with still more to do. Complimenting the tourism amenities and gaming facilities already in place in near-by Niagara Falls, the Fort Erie Race Track destination will also act as the Southern Gateway to Niagara and will offer visitors a unique opportunity to re-visit the Niagara area and explore Fort Erie as a component of their visit to the region. (Miller Creek Marina) - One of only a very few commercial operations along Fort Erie’s scenic Niagara Parkway, Miller Creek Marina may soon become a fabulous new tourism generator for Fort Erie, with over $150 million in redevelopment proposed at the site. Plans at the site include an expanded marina facility, small retail shops, a boutique hotel, restaurant(s) and a multi-residential component. The only marina facility on the Canadian side of the upper Niagara River, it is currently run by the Niagara Parks Commission, who until the Fort Erie EDTC stepped in to help identify alternatives, where planning to close the marina for financial reasons. Following a long, arduous process to explore opportunities for the site, an agreement between a renowned development team and the NPC has been established to determine the feasibility of moving forward on the proposed development project. The Fort Erie Economic Development & Tourism Corporation also works on an ongoing basis with Fort Erie’s smaller tourism stakeholders to help them facilitate their goals and build their capacity in marketing and strategic planning. For more information on the above noted development projects or on how the Fort Erie EDTC might be able to help your tourism based business, please contact a member of the Fort Erie EDTC staff at 905-871-1332.